(In the interest of full disclosure, we want to let you know that the products we use and review are products we’ve purchased ourselves after careful consideration. We don’t receive any products from fly fishing companies for free in exchange for favorable reviews. We do our research before buying and make our own decisions. We call it like we see it. If we like a product and feel it’s worth your hard earned dollar, we will let you know). Look closely and you can see Rising’s tactical curved forceps in the background. The bright red handles make it easy to spot them if you do drop them in the drink. Anyone that spends a lot of time on the water fishing understands just how easy it is to lose precious gear along the river. We’ve all been there and experienced that sick feeling when you watch something fall into the current and disappear in a flash, and you know it’s gone forever. Just a couple of weeks ago I dropped my small container of split shot in the river. And of course, since split shot is heavy weights, is was gone in the blink of an eye. A couple seasons ago I was getting pretty good at losing my hemostat/scissors for some reason and went through at least 3 pairs! The last pair I lost that season was by far my favorite, and I couldn’t remember what brand they were. After another two or three pair of hemoscissors, I finally found and recognized “The Pair.” I had been trying to find them ever since the river claimed them. I found them online at backcountry.com. 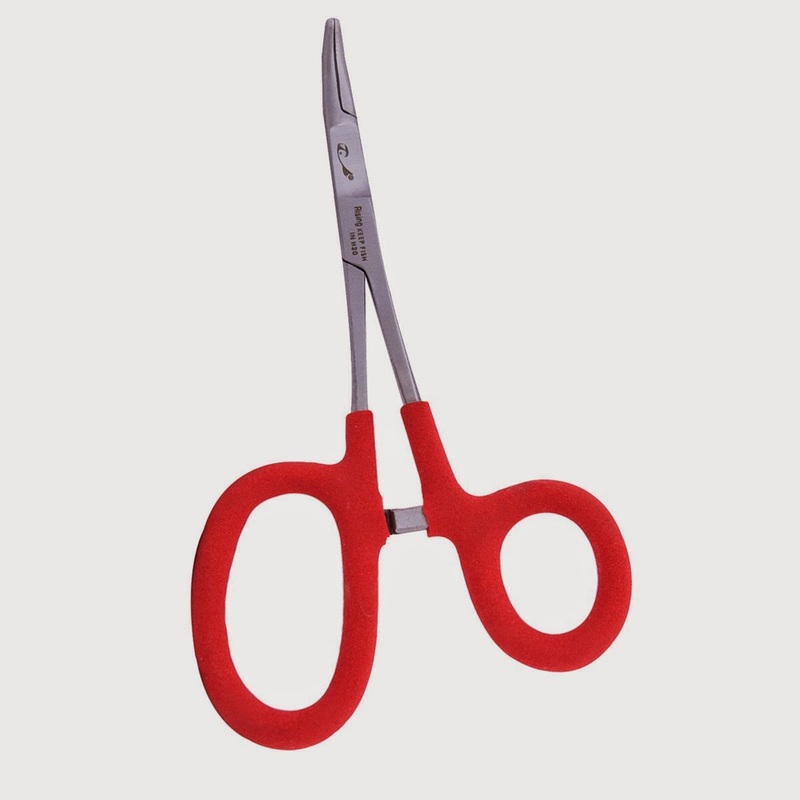 That pair just so happened to be Bob’s Tactical curved scissors by Rising. They are very well built and done right here in the great state of Utah. I have had similar products from Dr. Slick, Orvis, Anglers Accessories etc. Some have been okay and some have been awful, but none have come close to Rising’s Bob’s Tacticals. The serrated scissors cut like a dream and don’t act like they’ll go dull anytime soon (which is a huge plus for me). They are comfortable with the bigger thumb loop in your hand and feel heavy duty and built to last. I have the 6 inch pair and even at that big the angled tips allows you to debarb smaller flies. Also, the tips are magnetic, which come in handy many times. Overall, I am very impressed with these and hope that I don’t lose them anytime soon. That being said, I do guarantee I’ll lose them before I wear them out because they are a quality American made product built with ingenuity and obvious dedication to doing a job right. If that’s the case I will head out and find another pair to purchase. I did go with the red pair so if I drop them I will have a better shot at finding them. Rising throws in a tube of oil to keep them oiled up and working smooth. This is the first product I’ve tried from Rising and wasn’t let down so I’ll have to check out their other products. Go check them out at risingfish.net if you need a new pair, or want a pair that will last! Retail is $18, which may seem a little steep, but when viewed as a high quality long term investment, they are totally worth it. 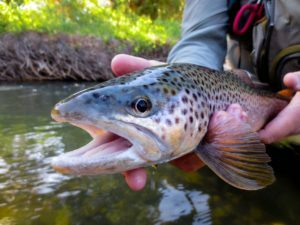 ← Our New Guide and a Dry Fly Fishing Video! Thanks for taking the time to do reviews on flys and fly fishing equipment. Its a big help when trying to by the stuff U need instead of the gadgets you don’t. The Videos are also very stimulating. Watching them is kind of like what listening to trickling water dose to U when you have to do U know what, except far more exhilarating…. Thanks Hoppy, glad you’re enjoying the newsletter! Let us know if there’s anything specific you’d like us to write about. Tight lines! Selecting and buying the right Fly Fishing Leaders and Tippet material sizes.